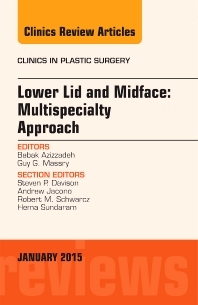 Following the popular success of the first volume published by Dr Azizzadeh and Dr Massry among cosmetic surgeons and physicians, the Editors present a second Multispecialty volume, this one dedicated to Midface and Lower face rejuvenation. The Editors have once again selected an expert team of Editors spanning the practices of Plastic Surgery, Oculoplastic Surgery, Facial Plastic Surgery, and Dermatology, with expert Authors presenting anatomy, techniques, procedure planning, complications, and outcomes in each specialty field. Topics are planned on: Complications of Lower Blepharoplasty and Midface lifting; Deep Plane Face Lifting for Midface Rejuvenation; The Transeyelid Midface Lift; Management of Post-blepharoplasty Lower Eyelid Retraction; Contemporary Thoughts on Lower Eyelid/Midface Aging; Aesthetic Canthal Suspension; Dark Circles: Etiology and Management Options; Laser Resurfacing Applications for Periocular Rejuvenation; Non-Resurfacing Approaches for Lower Eyelid Rejuvenation; Skin Care For The Lower Lids: “Bags,” “Dark Circles,” and “Wrinkles;” Volumetric Strategies for the Lower Lid and Midface; Transcutaneous Lower Lid Blepharoplasty With and Without Fat Repositioning; Fat Grafting of the Lower Lid and Midface; Transtemporal Midface Lifting to Blend the Lower Eyelid Cheek Junction; Utilizing a New Classification of Midfacial Aging to Customize Multimodality Midface Rejuvenation Surgery; Transconjunctival Lower Lid Blepharoplasty with and without Fat Repositioning, among others. Any practitioner of cosmetic facial procedures, invasive, minimally invasive, or non-invasive, will receive a wealth of information from expert practitioners who obtain excellent results.